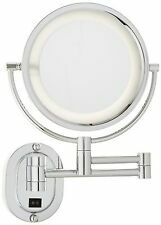 Kimball and Young 20144 Pivot Arm Adjustable Wall Mirror, Chrome,Retail $231.00! Part Number 20144. Item model number 20144. Width 26.7 centimeter. Length 19.7 centimeter. Batteries Required? Item Package Quantity 1. Item Weight 1.2 Kg. Product Dimensions 19.7 x 26.7 x 29.2 cm. Hole Spacing Req'd: 24" center to center (you can not drill thru tempered glass). Glass mount, used for tempered glass doors (not for wall). 24" center to center. Includes 2 Brackets and Mounting Hardware. With Detachable 10x magnification mirror- allows you see details of eyeliner, mascara, eyebrows and grooming of unwanted hairs. - Adjustable Brightness - The dimmable vanity mirror allows you to see the finest details without being harsh on your eyes. 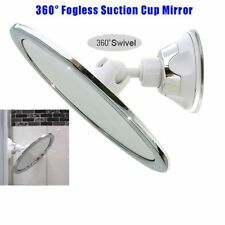 360°adjustable of the mirror and the stand, you can adjust for the best angle. 1 x Mirror. Color: Silver. Note: Battery is not included! Type: Double Side. Finish: Oil Rubbed Bronze. 5 minute installation - allen wrench includedSpecs 6" Back to Back Pull. Hole Spacing Req'd: 6" center to center (you can not drill thru tempered glass). Glass mount, used for tempered glass doors (not for wall). Mirror Stainless Steel 2 Sided Magnifying Makeup Ikea Assembled size Diameter: 17 cm This product requires assembly Key features - One side with magnifying mirror glass. - Suitable for use in high humidity areas since it is water-resistant. Care instructions Wipe clean with a cloth dampened in water or window-cleaner. Wipe dry with a clean cloth. Product description Basematerial: Stainless steel Mirror: Glass Package measurement and weight Packages: 1 Width : 19 cm Height : 3 cm Length : 2. Compact design makes it convenient to carry in a bag or purse. Mirrored glass provides a clear reflection. Easily mounts to any smooth flat surface. Trending at C $385.15eBay determines this price through a machine-learned model of the product's sale prices within the last 90 days. Mirror Defogger / Demister. The mirror defogger is a small electrical heater which is designed to warm the surface of the mirror, resulting in mirrors that remain clean and clear, even in the steamiest of conditions. 6-1/4" mirror LED lighted bulb. Dual Lighted. This mirror features two 6-¼" mirrors which are illuminated that gives the effects of natural sunlight, giving you light you will need. Travel pouch included in the box. Mirror, of exquisite seduction. Un cadre délicat en étain coulé orné de symbole sur le cosmos entoure ce miroir léger et incassable, d'une. Pièce rare et ancienne datant de 2004. Rare and old piece dating from 2004. The Forma line by InterDesign successfully combines stainless steel beauty and style for household accessories unlike any other. 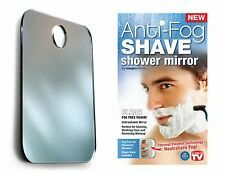 This fog-free mirror is specifically designed for shaving in the shower or other grooming practices where steam can be a problem. Electric heating film (width 80 cm), 220V, 110 W/m - 75cm (80cm x 75cm), warranty - 10 years;. - Width: 80cm. 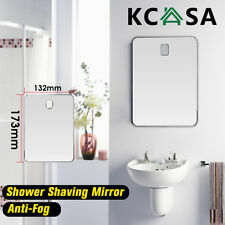 Heating foil which protects bathroom mirror anti-fog. You can buy any quantity (any size) of the heating film and thermal regulators! 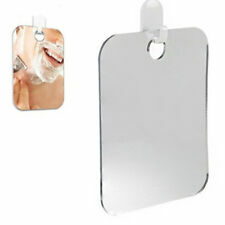 Fogless Mirror provides you clear view, perfect for placing in bathroom, for your shaving and make-up. 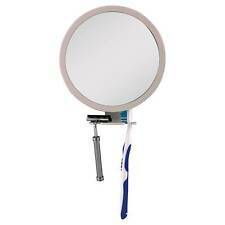 1 x Fogless Mirror. Advanced rotation so you Mirror Rotates 360 degree for adjustable angles allowing you to position the shower shaving mirror in whichever direction that’s needed. Magnifying: Yes, 3X. Mirror Type: Dual View. 1 x Mirror. Shape: Round. We'll do our best to help you solve the problems you may have. We will work with you to until you are satisfied. 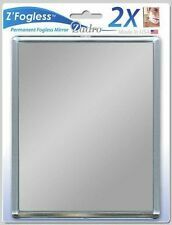 American Specialties Inc. Mirror, 18" x 36"
When you are trying to get ready in the morning or right before bed, you rely on your bathroom mirror to make sure everything is in place. Even though a mirror's primary job is to be functional, the right mirror can also enhance your bathroom decor. What types of bathroom mirrors are there? Venetian mirrors: These bathroom mirrors have elegant designs etched into the glass. They usually have an ornate frame in white that gives off a romantic flair to the bathroom. Pivot mirrors: This accessory is mounted on hinged pivots that are connected to the bathroom wall. You can move this fixture around as needed to make sure you hit all the right spots. Extension mirrors: This fixture extends from behind the cabinet on an accordion mount. They work well in bathrooms that have smaller spaces or tighter layouts. Lighted mirrors: The extra light can help you illuminate the bathroom or allow you to see your face more clearly. Vanity mirrors: Vanity mirrors are designed to sit on top of the counter or cabinet. These are often additional accessories that are used to help apply makeup. What are some bathroom themes with respect to mirrors? Seashore: Seashore and cottage themes are an option for those who wish to make the space feel light and airy. Mirrors with white frames or even seashell frames are common for this theme. 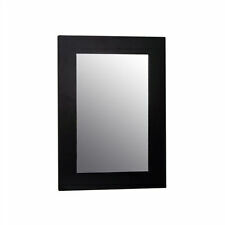 Contemporary: Contemporary-style rectangular mirrors are often frameless or have a simple, understated frame design. Traditional: Those who enjoy traditional decor may be looking at vanity mirrors and large, full-bodied wall mirrors. Romantic: Bathroom mirrors that are made in the romantic style are often oval and may have a light-coloured or white frame that is ornately carved. What considerations should you make when choosing bathroom mirrors? Size: When looking at a bathroom collection that includes a wall mirror, consider its size to ensure that it will fit. Shape: Since wall mirrors come in a variety of shapes, you want one that looks good in the space and gives you ample room to get ready at night or in the morning. Function: Before purchasing a wall mirror or other accessories, you should consider whether or not they will work for what you need. 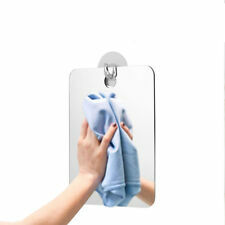 Mounting: Wall mirrors and other accessories can be heavy, so ensure that your walls are strong enough to support them.